Woods Creek is a 160 acre ranch located in the heart of Teton Valley near Driggs, ID on the “quiet” western side of the famous Teton Mountain Range. The ranch offers a sizable wildlife and fisheries sanctuary and big mountain views of the world famous Teton Mountains and Big Hole mountain ranges. Set in one of the most scenic valleys of the Greater Yellowstone Ecosystem, Woods Creek offers two professionally enhanced wetland complexes creating the ideal habitat for waterfowl. Eighteen tillable acres planted with barley and wildlife food plots provide a desirable habitat for deer and the abundant moose of the area that frequent the property. The uplands and grain also attract the native sharp-tailed grouse with healthy coveys found throughout the ranch. The ranch contains roughly 1.2 miles of Woods Creek, a private spring creek ranging in width from 10 to 20 feet. Woods Creek serves as a spawning tributary for the Teton River located just a quarter mile downstream of the ranch. 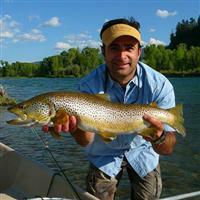 The creek holds ample numbers of Brook Trout and native Yellowstone Cutthroat Trout. Woods Creek is located 3 miles west of Driggs, ID and 45 minutes from Jackson Hole, WY. Driggs offers every amenity including Reed Memorial, a full service FBO with a 7,300 foot runway and two highly publicized private golf courses, Teton Springs and Huntsman Springs. Teton Valley is also home to Grand Targhee Ski and Summer Resort. Grand Targhee consistently ranks as one of the top ski resorts in the country year after year and hosts several summer music festivals. Woods Creek offers exceptional recreational opportunities including some of the best waterfowl hunting in the area, private spring creek fishing and excellent white-tailed deer hunting. Extensive wetland enhancement work has been completed, along with a 2.3 acre trout pond currently under construction and in-stream enhancement project scheduled to be completed by spring of 2015. The ranch is located in the heart of the Greater Yellowstone Ecosystem and offers close proximity to some of the West’s most well know trophy trout streams such as Idaho’s Teton River, the Henry’s Fork, the South Fork of the Snake River and the world famous Madison River in Montana. The southwest entrance to Yellowstone National Park is 40 minutes from the ranch.